THESE A BEAUTIFUL, THICK LUXURIOUS TOWELS THAT I BOUGHT FOR A GIRLS WEEKEND THAT I MONOGRAMED WITH ITIALS. GREAT BUY. This luxury Turkish cotton fitted lounge chair cover is monogrammed with the initial of your choice in a navy blue thread. 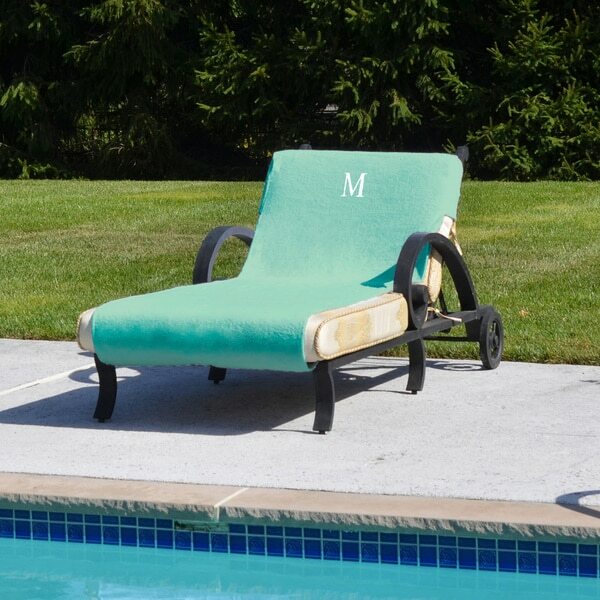 This luxury Turkish cotton fitted lounge chair cover is featured in beautiful aqua green color and monogrammed with the initial of your choice in a white thread. The custom fit, stay in place towel lounge cover offers lounging comfort while providing superb personal hygiene for your days in the sun. I am Turkish and I know Turkish towels. This is very poor quality towel. But will keep them. Very bad reputation for real Turkish cotton products.. These are great covers for your cushions. They protect your cushions from dirt and are very absorbent. They are easy to wash and dry. the monogram is cute. This has been a great fit for my lounge chair by the pool! It took while to find towels that actually cover the length of the chair and these are great! All summer long we got asked where we got these towels! I love the color but they are a little too big for our chairs. We do not have pads on them but we just need to figure out how to work around that. Definitely makes them look prettier and matches our patio furniture. It's difficult to find long towels like this which is perfect. A little disappointed since I was hoping the cotton would be thicker but still love them. I love this. It's long so your feet stay on the towel. I'm mad I didn't order 2. Very large and good quality but didn't like the fit to well. "does this cover fit on a chris knight lounge chair?" This cover is 32 x 102; it will cover a "Christ Knight Lounge Chair" easily. The excess length is generally tucked under the chair.